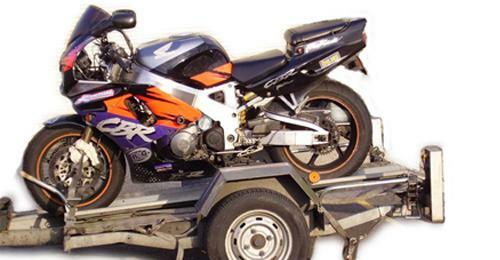 Westbourne Motors has over 40 years experience in motorcycle recovery. Nothing is too difficult we carry mopeds, super bikes, trikes and choppers. All personnel are fully trained in motor cycle recovery techniques. Every precaution is taken to protect every part of the machine. Special care is required to prevent damage to magnesium or alloy wheels and other polished or painted areas. Fully insured, risk free transportation. Recovery to all UK destinations. Custom made motor cycle equipment and recovery trailers for all makes of bike. Staff are fully trained and kept abreast of changes in legislation, technology and safety matters. Our 24 hour UK Control Centre monitors and tracks all motorcycle rescue and recovery services. For expertise, quality of service and affordable prices choose Westbourne Motors.